Kiitos Capital Management manages the Kiitos Global Opportunities (KGO) fund, a Long-Short equity portfolio focused on stocks impacted by Global H.E.A.T. (Healthcare, Environment & Agriculture Trends). 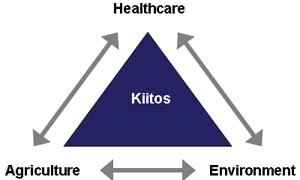 Kiitos employs a bottom up, value-based and ROIC-driven investment philosophy to build a liquid, diversified global portfolio made up of 50-70 positions. Underlying the value-based strategy behind the fund is the belief that long-term stock returns are directly related to a business’ sustainable ROIC, valuation and growth rate. The long book is typically composed of high (or rising) ROIC, low P/E names, while the short book is made up of low (or declining) ROIC, expensive names. We adhere to rigorous rick control parameters and aim to deliver uncorrelated, positive returns in all market environments with below market volatility.